We’d love your help. Let us know what’s wrong with this preview of A Dog Before a Soldier by Chuck Veit. 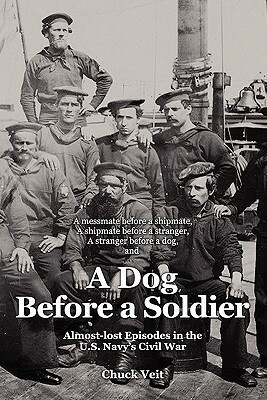 To ask other readers questions about A Dog Before a Soldier, please sign up. A collection of articles about little-known episodes of the US Navy during the American Civil War. Where else will you read about the Navy herding 1500 Texas longhorn cattle, captured from Confederate-friendly drovers, down the Mississippi River to Union-held territory? These articles are scholarly, well researched, and captivating, and we can thank Chuck Veit for rescuing these stories from obscurity. I look forward to another of Chuck's titles, "Sea Miner," which I have in hand, and will no dou A collection of articles about little-known episodes of the US Navy during the American Civil War. Where else will you read about the Navy herding 1500 Texas longhorn cattle, captured from Confederate-friendly drovers, down the Mississippi River to Union-held territory? These articles are scholarly, well researched, and captivating, and we can thank Chuck Veit for rescuing these stories from obscurity.